There was a time, pre GSX-R, when Suzuki decided to have a good look at the 750 road bike market. 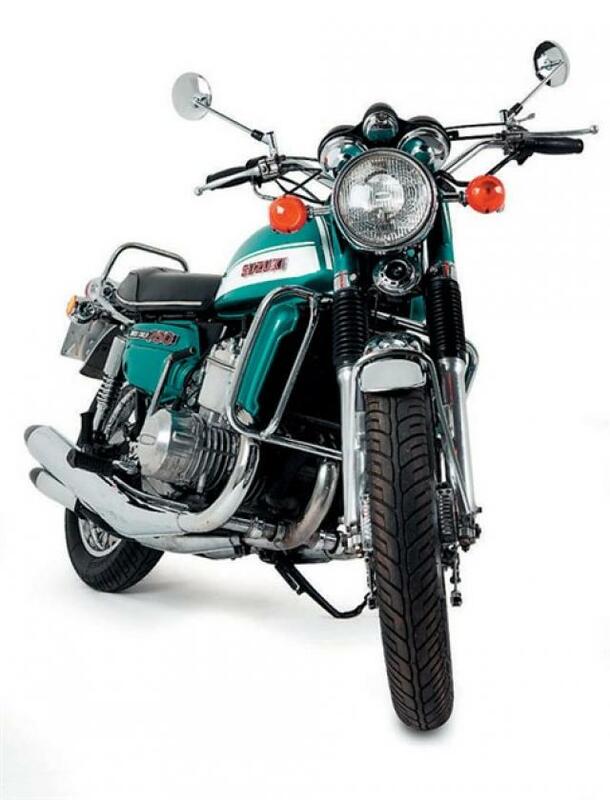 This was a time when Honda had the mighty CB750 and Kawasaki was planning its own version of a sports 750, the H-2 that went on to be known as the 'Widowmaker'. 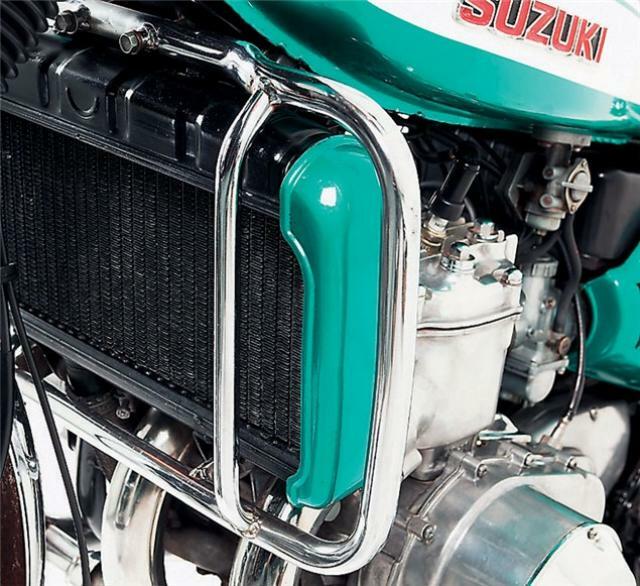 This was 1972 and Suzuki was about to start building its longstanding reputation for excellent 750cc motorcycles. 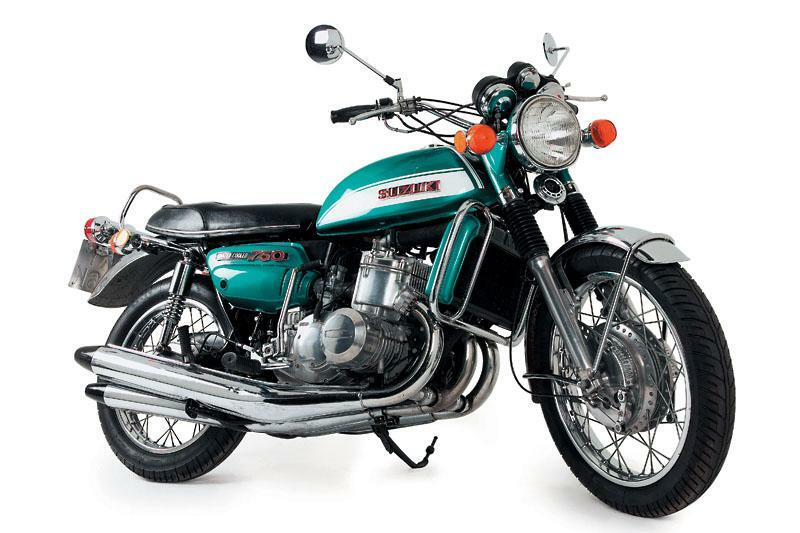 This bike was the GT750. Expectation was high for a screaming two-stroke banshee with rapier-like handling. The bike was created by Etsuo Yokouchi a man responsible for Suzuki's earlier 'T' range and later versions of the RG500 GP bike. The launch had been delayed for reasons undisclosed, some theorising that Suzuki was making last minute changes to bring it up to the speed of its rivals. Despite initial misgivings from the press, that was soon to change when tested on real roads for longer periods. Suddenly, the bike made sense and buyers snapped them up - especially in America where they were bought by the crate load. The bike itself was quite heavy - 214 kg heavy when dry - but this didn't seem to affect the handling too badly. In fact, the extra bulk made the GT very stable (for the time), although it couldn't match its competitors for sports handling. The ride was most impressive when the GT was used in a touring function, being able to cruise at high speed in relative comfort. This was due to clever weight distribution and a low centre of gravity which, when coupled with suspension slightly on the soft side, made long journeys a joy. 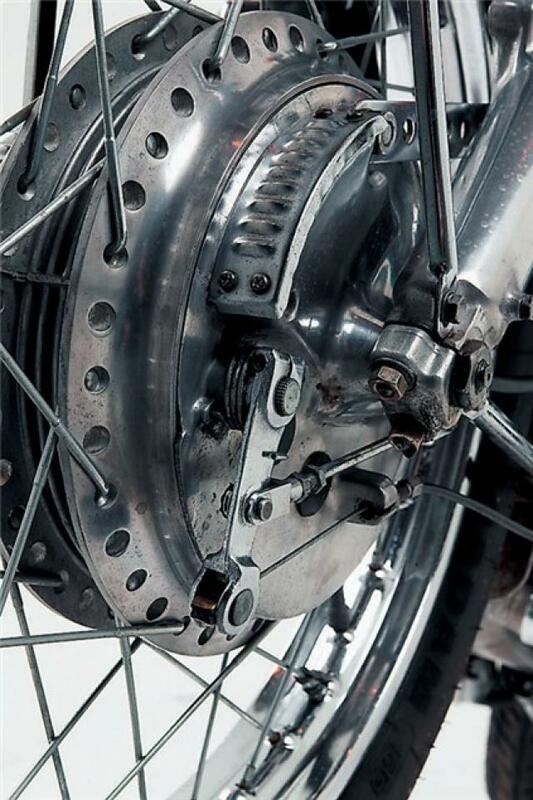 The drum brakes were effective, but were replaced one year later with a twin disc system. The original drums had been criticised for being slightly spongy and lacking feel but were considered better than the later model's discs in wet weather. The advanced three cylinder 738cc water-cooled engine produced 67bhp @ 6500rpm and would rapidly propel the GT to a respectable 110-plus mph despite its weight. The Honda was marginally quicker and the H-2 also had the legs over the Suzuki, but the motor would come into its own eventually. 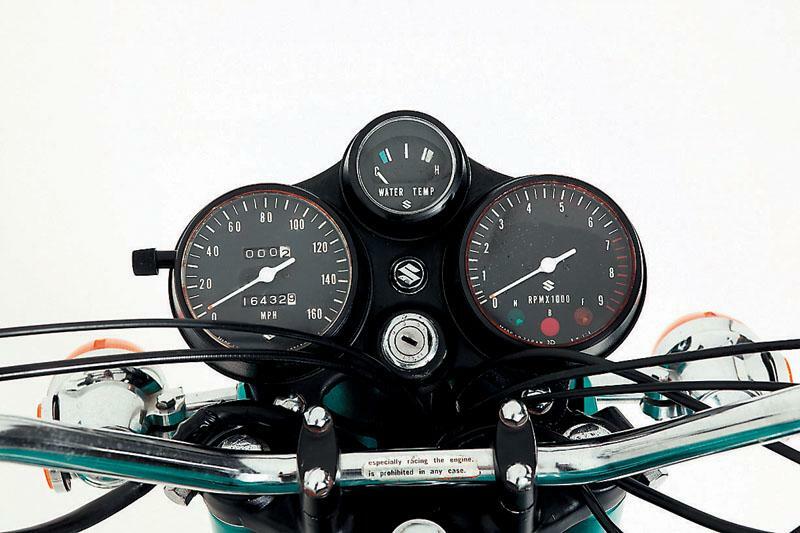 The two-stroke engine had a strong flat torque curve producing useful drive from as little as 2000rpm and proving a more sophisticated ride than its peakier H-2 rival. 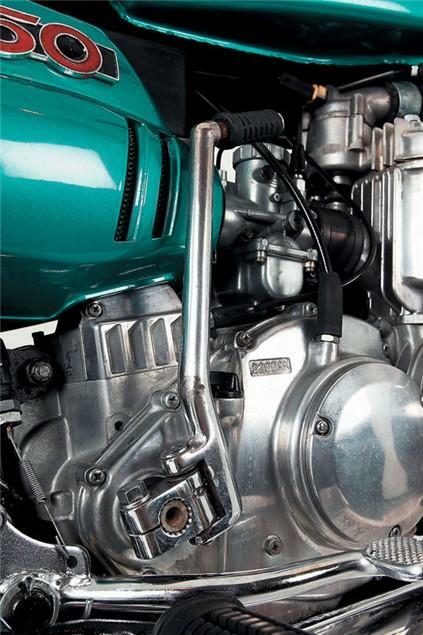 The motor was essentially an existing twin design with an extra cylinder and it was the first Japanese bike to feature liquid engine cooling. With a large (and later chromed) radiator, the cooling system was responsible for the extra weight, but it did help to increase the engine's longevity. Its smooth yet strong delivery was a hit with consumers. 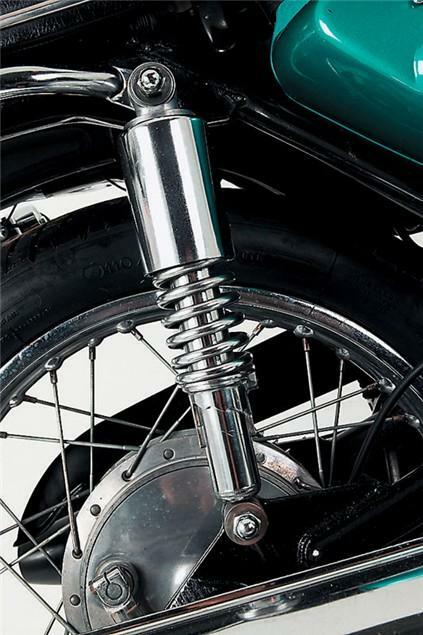 In contrast, the faster Kawasaki was gaining a reputation for exploding and the infamous 'hinge in the middle' chassis that helped earn its foreboding nickname. 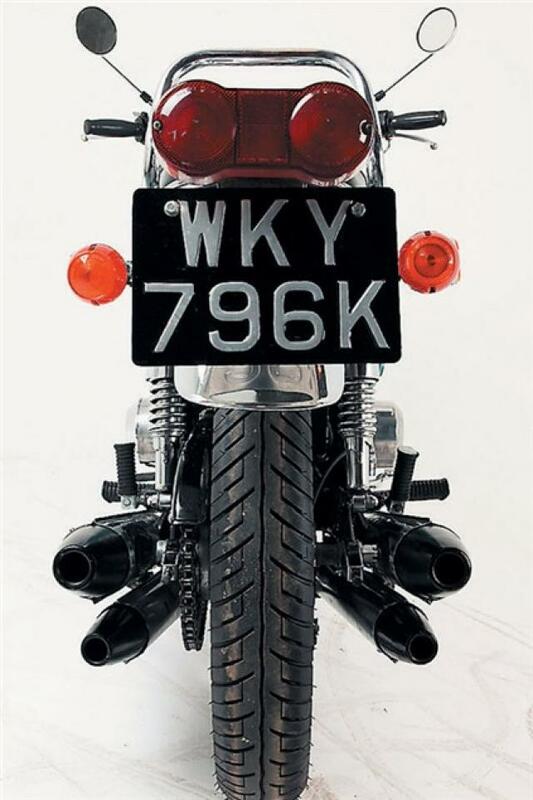 While this was appealing to headbangers, the majority of motorcyclists found the GT a much better proposition for everyday riding, making it a huge sales success. This didn't mean the GT couldn't perform if altered a little. The limited edition 750S was lighter and came complete with race seat, fairing, tweaked suspension, new yokes and clip-on bars. While this could cut the mustard from a sporting perspective, it was a short-lived and very rare model. Owners themselves performed most of the performance enhancing modifications, as was the norm in the '70s, utilizing the growing number of GT aftermarket goodies. 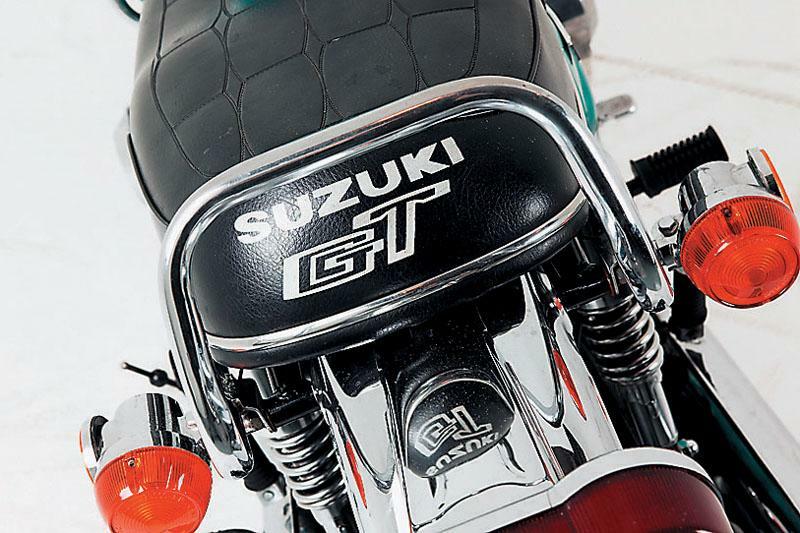 As has so often been the story with many iconic motorcycles, emission laws finally killed off the GT after 1977. The bike had been improved almost each year with the most effective revamp occurring in '75 and it was still a popular machine for many years afterwards. It also became a favourite with drag racers and there are still those being thrashed mercilessly on the strip today. With some heavy tuning mods, engines have been known to produce over 120bhp - almost double the original output and ensuring an exhilarating quarter mile! This is partly down the reliability of the engine design proving technically superior in later life, compared with other two-strokes of the same era.